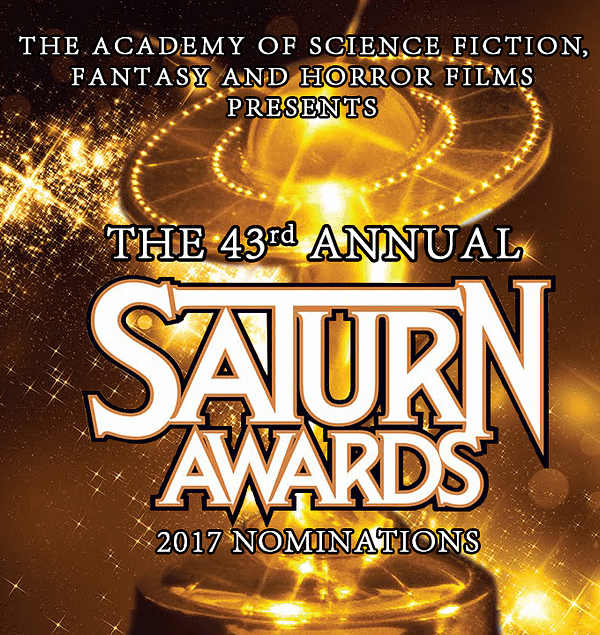 The 43rd Annual Saturn Award Nominations Have Been Announced! Home » Film » The 43rd Annual Saturn Award Nominations Have Been Announced! The Academy of Science Fiction, Fantasy, and Horror has announced their 2017 nominations today, and the list is expansive to say the least with over 40 categories spanning television, film, streaming content, DVD/Blu-Rays, and one for the Los Angeles theater scene for good measure. Rogue One leads the films with 11 nominations, and The Walking Dead it still the powerhouse to be contended with in 7 categories. HBO isn’t far behind, with Westworld garnering six nominations. There’s a few head-scratching moments in the lists, such as with the placement of Hidden Figures in the Action & Adventure category (but if the Golden Globes can call The Martian a comedy, then it’s not as much of a stretch to call Figures an Action film). One category of note is the nomination of Cathy Bates for her role in American Horror Story in the Best Supporting Actress for a TV series. Since her character in AHS centered around having been nominated for a Saturn Award for this very role, in the show. Not sure if I’d rather her win or lose, I think win, since it was her having lost on the show that caused things to go downhill very quickly. They’ve done up a pair of nomination videos hosted by Valerie Perez; the TV noms are presented by Violets Beane and Janina Gavankar, and the Film nominations are presented by Clare Kramer and Greg Grunberg. Below the videos, we’ve got the comprehensive list of all of the 2017 nominees. The Academy will be holding it’s annual awards ceremony on June 28th at the Castaway in Burbank, California. Batman v Superman: Dawn of Justice Ultimate Ed. This Is Not A Cassette. It’s Marvel’s New Guardians Of The Galaxy Credit Card.